Roger Tapias and Ramon Dordal is a stable duo since 1994 Both guitarists were completed her studies at the Conservatory of Music of Barcelona awarded with distinction as a soloist and in chamber music ensembles. Have been awarded in several competitions like the "Regions Européen", "Vila de Salou" "America Martinez" and "Granados- Ravel." They have worked with teachers such as Jordi Codina, Joan Furio and other internationally renowned guitarists like Alvaro Pierri, David Russell, Pavel Steild, Ricardo Gallen and Marcos Socias, among others. In 1996 they had the pleasure to make the world premiere of the renowned composer Carles Guinovart Cosmogony, and in 1999 the work of composer Christian de Jong "3x2" obtaining a brilliant critique by composer and other personalities. The composer Michael Goleminov dedicated them the work "Nocturno" for guitar and electronic background. Several media have echoed their actions. Their repertoire ranges from music of the Renaissance, Baroque, through classical to contemporary music. Also South American styles such as Cuban Leo Brower, Jorge Cardoso and the Argentine Astor Piazzolla compositions using current and new technological features like the amazing loop station. Currently, they combined concert with teaching. 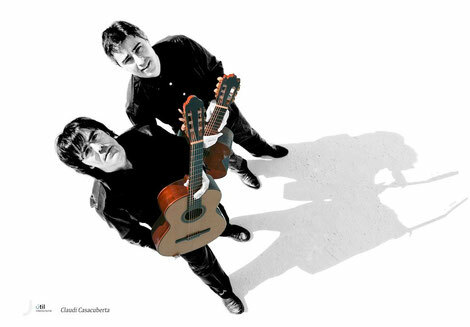 Dordal teaches guitar at the Conservatoire in Vic and Roger Tapias teaches guitar at the Conservatory of Girona.